Placental abruption is where a part or all of the placenta separates from the wall of the uterus prematurely. It is an important cause of antepartum haemorrhage – vaginal bleeding from week 24 of gestation until delivery. In this article, we shall look at the pathophysiology, clinical features and management of placental abruption. Placental abruption is where a part or all of the placenta separates from the wall of the uterus prematurely. Abruption is thought to occur following a rupture of the maternal vessels within the basal layer of the endometrium. Blood accumulates and splits the placental attachment from the basal layer. The detached portion of the placenta is unable to function, leading to rapid fetal compromise. Revealed – bleeding tracks down from the site of placental separation and drains through the cervix. This results in vaginal bleeding. Concealed – the bleeding remains within the uterus, and typically forms a clot retroplacentally. This bleeding is not visible, but can be severe enough to cause systemic shock. 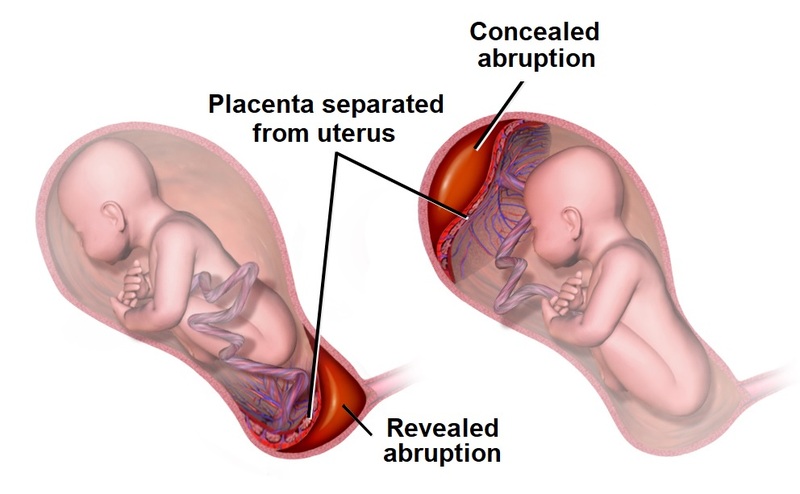 Fig 1 – The two main types of placental abruption; concealed and revealed. Bleeding in the first trimester, particularly if a haematoma is seen inside the uterus on a first trimester scan. Any woman presenting with antepartum haemorrhage should be assessed in a systematic manner (see box below). Placental abruption typically presents with painful vaginal bleeding (bleeding may not be visible if it is concealed). If the woman is in labour, inquire about pain between contractions. On examination, the uterus may be woody (tense all of the time) and painful on palpation. Placenta praevia – where the placenta is fully or partially attached to the lower uterine segment. Marginal placental bleed – small, partial abruption of the placenta which is large enough to cause revealed bleeding, but not large enough to cause maternal or fetal compromise. An ultrasound scan should be performed when patient is stable. In placental abruption, a retroplacental haematoma may be visible. Ultrasound has a good positive predictive value, but a poor negative predictive value – and should not be used to exclude abruption. 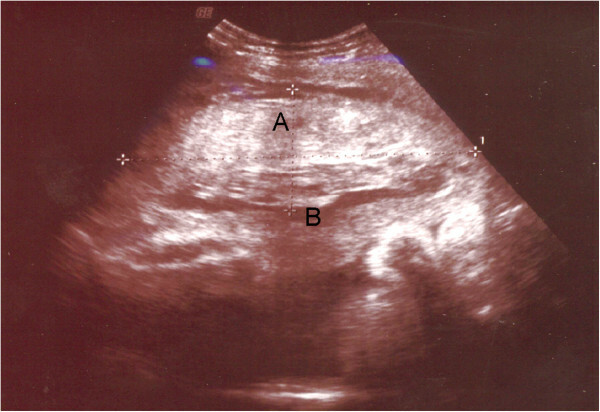 Fig 3 – Placental abruption on ultrasound. A – retroplacental haematoma. B – placenta. Emergency delivery – indicated in the presence of maternal and/or fetal compromise and usually this is by caesarean section unless spontaneous delivery is imminent or operative vaginal birth is achievable. Even if an in-utero fetal death has been diagnosed, a caesarean section may still be indicated if there is maternal compromise. Induction of labour – for haemorrhage at term without maternal or fetal compromise, induction of labour is usually recommended to avoid further bleeding. Conservative management – for some partial or marginal abruptions not associated with maternal or fetal compromise (dependant on the gestation and amount of bleeding). In all cases, give anti-D within 72 hours of the onset of bleeding if the woman is rhesus D negative.